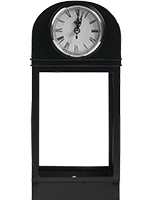 Vintage inspired curves highlight a real working clock on this black lacquer finished lantern. 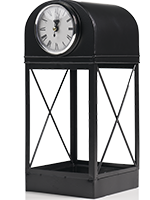 The silver accents and roman numerals add a generous dash of nostalgic appeal. Requires 1 - AA Battery (not included) Measures 5.25” diam. x 12” h.